I liked how quickly it arrived. Keep carpets fresh and clean with the impressively effective and conveniently portable Dirt Devil Breeze. Weighing in at just over thirteen pounds, this power-house is easy to push and carry, and includes all the features you need to keep your home clean and free of dust, dirt, and allergens. The dirt devil vacuum does what I need. Terrible if you have pets- don't bother. We have pets- dogs. I cannot get a vacuum cleaner to last more than 1 or 2 uses. Once it's used; even after a thorough cleaning, when using it again; it leaves huge lines of brown dirt in rows on the carpet (We live in the south- red clay!). So long story short, it ends up getting the carpet worse than before using, because I now have red dirt lines, which rub back into the light carpet and stain it worse. This is the 3rd vacuum- and the first Dirt Devil. I was hopeful a new brand would work- but at least the others worked more than twice before it started doing this. This one was a 2-use POS- waste of money!!! If you have pets- don't bother. The hair won't go up the tube to the canister. I love this sweeper. I put it together and ran it and could not believe everything I picked up. I have an Oreck and thought it was great but seeing what this Dirt Devil Breeze does makes me glad I ordered it. This vacuum not only fits the color of the decor but it is also small enough and powerful enough to clean my 3 room small city apartment. Being bag less is great for my allergies and the ease at which I can dispose of the dust and dirt is amazing. My family has always used a Dirt Devil and I will continue this tradition. Better than the *** I have been using. Being a bag-less vac a BIG plus. Saves money and good for the environment. Two good attachments make this work everywhere. I have used it in the garage to clean the car and the brush makes dusting a breeze. This is much louder than anticipated but also so powerful that I don't really care. Cannot beat at 3 X the price. medium weight & good suction - deep cleans & picks up everything. cord rewind great feature. great price for this upright compared to other brands that don't even have as many features or attachments. Is light and it get up the dirt. I'm not sure how you can beat a dirt devil from overstock. 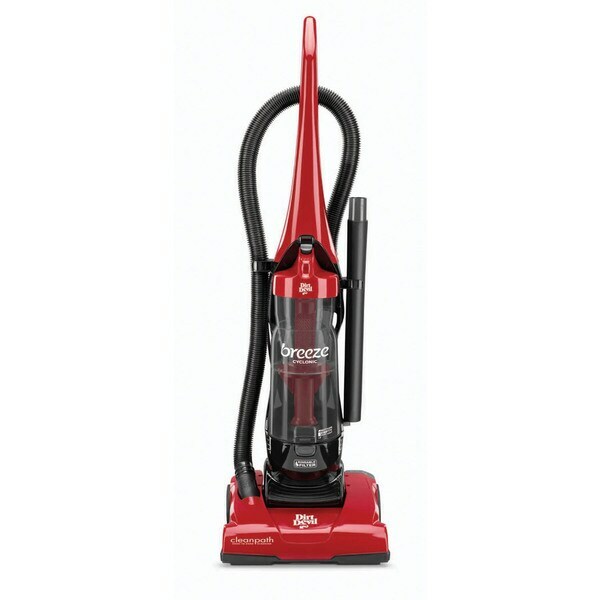 It's a great vacuum, lots of suction power and efficient attachments for a great price. Awesome. Vacumes. !!!!!!!!!! For. The. Money. !!!!!!!!!!!!! I am sometimes a bit lazy and with moving to a new place, starting a new job, etc., I fell into a bit of a rut and did not read the instructions before trying to use this gem of a vacuum. BIG MISTAKE. I would have sent it back as defective. After seeing the plea on the packaging to call in before sending it back, I decided to actually read the instructions. Super glad that I did. This baby is wonderful. The price is great and it is picking up dirt like Pig Pen. Great buy. One of he beat vacuums I’ve bought and I also own a Dyson but the humble dirk devil beats it hands down! I’m very pleased with its easy assembly and ease of use. Love the color! A good vacuum for the price, it works good and lightweight. Cleaning made easy! It was very easy to put together. I would recommend this for an small place. IT PICKS UP VERY GOOD IT REALLY HAS KICK TO IT AM VERY PLEASED. I LIVE IN A CONDO I DIDN'T NEED A BIG VAC IT WORKS LIKE A BIG VAC I WAS SO SURPRISE TOO SEE ALL THE DIRTY & DUST IN THE CUP ALSO NO BAGS NEEDED THAT'S A BIG PLUS FOR ME AM GLAD I BROUGHT IT. This is great but would be even better if it had a bag ~ messy when emptying. I purchased this as a gift. Was a great value for the money I spent. Recipient was very pleased with the gift as well. I would definitely recommend this to others. No power, short cord, has a burning smell when used on carpet. Hard to imagine a company like Overprice allows this to be sold. Love my vacuum , I love to clean my house here in Brooklyn . And also the house I have upstate , where I go once a month to relax with my family . It was cheaply made, all plastic. Works good, hope it holds up. "One reviewer said this was a loud vacuum. Is it noisy?" There is nothing saying this is a quiet vacuum. "How many watts is this vacuum? Is it new or refurbished?" This vacuum is 120W and is brand new. "Does this model work On shag area rugs"
"what is the diameter of the hose?" "What tools come with this sweeper. My box was opened when it was delivered." Hello Deblip, the included tools will be listed in the instructions and/or manual. Please contact Overstock Customer Care at 1-800-The-BIG-O (843-2446) if any pieces are missing from your order. Thanks for shopping with us! "It does have extensions right? How tall is it at the maximin hight?" Hello Jackson, this vacuum does not have extensions besides the hose extension. Thank you for shopping with us!